A quick stop into Target turned into a organizational shopping spree of sorts. They had everything I had been looking for, in all the colors I wanted. Such luck! I had been wanting to change out our flour/sugar canisters in the kitchen for awhile (3 years). We had some cheap white canisters that have been getting us by, but I just don't like white in the kitchen. 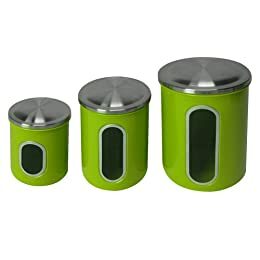 I was looking for glass or stainless steel, but the green of these match our KitchenAid mixer perfectly. Plus they were on sale for $11 (for all three) at our Target! We also got some great storage bins for the bathroom. Apparently they do not exist on the Target website, so as soon as they are up and storing I will take pictures! I'm really happy with the stuff I have been finding at Target. Have you been finding anything good there? If so, what? Target is my favorite store ever! I love to scan the clearance ends when I go there. I recently picked up some cute picture frames for less than $2 each. I also scored some clothes for my niece a few days ago- three shirts and a sweater for $9! I just hooked my kid up with snow pants and boots for $7! I love clearance days at Target!